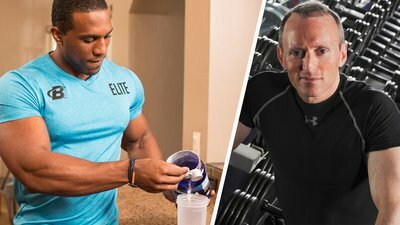 Ask The Muscle Doc: How Does Creatine Help Muscle Gains? There's a mountain of research showing that creatine can help produce muscle growth and make training more effective. But how does it actually do it? An elite researcher breaks it down. Q: I've read enough at this point to know that creatine often helps increase muscle mass. But I haven't seen an explanation of how. So, what's the deal? However, the mechanisms by which creatine builds muscle remain somewhat speculative. So, let's look at the most plausible and research-backed possibilities. You may already know this, but creatine does far more than just help muscle growth. It is also highly effective at producing strength gains—and that may be part of the answer. If you're stronger, you're going to be able to manage heavier loads in a given repetition range and thus generate more mechanical tension—a primary driving factor for hypertrophy. That's one explanation. Muscle growth may be further enhanced by creatine's volumizing effect. You see, creatine acts as an osmolyte, pulling water into the muscle. Not only does this enhance muscle size, but it also has been theorized that the associated cellular swelling contributes to hypertrophy. Specifically, test tube research shows that cell swelling increases muscle protein synthesis while decreasing protein breakdown—a hypertrophy home run! How this plays out in practice isn't clear, but it provides an intriguing potential explanation for creatine's effectiveness. It's worth noting, though, that we're not necessarily looking at an either-or situation here. As I explained in my review paper "The Mechanisms of Muscle Hypertrophy and Their Application to Resistance Training," cell swelling and mechanical tension both may play a role in muscle growth, as might muscular damage. It's entirely possible that creatine can positively impact two, or even all three, of those mechanisms. One other reason that creatine is so effective is because it's not a supplement you need to cycle, for either health or financial reasons. Keeping your stores perpetually elevated only helps to ensure maximal gains, and creatine monohydrate—the most science-backed form of the supplement—is among the cheaper supps out there per serving. When I say that it doesn't need to be cycled for health, what I really mean is that creatine has been repeatedly shown to be safe, even with long-term use. The only reported issues are some isolated anecdotal claims of cramping, which have not been replicated in controlled research. And contrary to popular belief, creatine doesn't cause bloating, either; the increase in water is within the muscle, not beneath the skin. So, allegations that creatine will puff you up like a water balloon are nothing more than hot air. It's important to note that a relatively small percentage of the population, possibly around 20 percent, are "non-responders" to creatine, conceivably due to a combination of genetic and nutritional factors. Those who fall into this category don't realize any additional benefits from supplementation. My advice is to give creatine a try and see how it works for you, personally; if you don't see results in a couple of months, you're likely a non-responder. There are two basic strategies to take creatine. For fastest results, consume approximately 5 grams of creatine four times daily for a week—or if you want to be more scientific and tailor the regimen to your specific needs, go with 0.3 grams per kilogram of body weight. After completing this loading protocol, consume around 3 grams daily. Alternatively, you can simply consume 3-5 grams daily, which will ultimately achieve the same saturation level as with loading within about a month. Creatine supplements come in a variety of different forms. My suggestion is to stick with good old creatine monohydrate. Although a number of designer forms have been hyped as better muscle-builders, the current research shows no added benefits. Given their higher cost, the monohydrate form is your best bet. Take it daily, train hard, and don't be surprised if the scale moves in the right direction! Becque, M. D., Lochmann, J. D., & Melrose, D. R. (2000). Effects of oral creatine supplementation on muscular strength and body composition. Medicine & Science in Sports & Exercise, 32(3), 654-658. Schoenfeld, B. J., & Contreras, B. (2014). The muscle pump: potential mechanisms and applications for enhancing hypertrophic adaptations. Strength & Conditioning Journal, 36(3), 21-25.